As a rapidly growing company – 12 acquisitions in recent years – SolarWinds faced an HR problem. It needed to engage new employees quickly and find a simple system that could keep for employees in various locations globally. 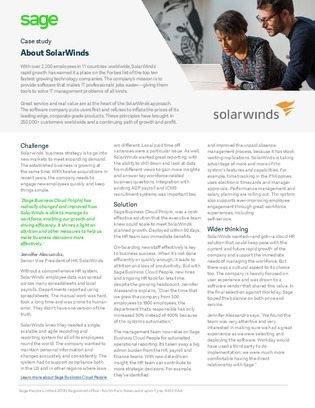 Explore how SolarWinds turned to a cloud-based HCM platform that they could deploy within 90 days, and see how the move resulted in some unexpected benefits.